Do you see rubbish lying around and want to pick it up? Well now you can. The Parish Council has bought a litter picking kit which is being stored by Karen at Cafe Eleven. Any time the cafe is open you can pop in, borrow what you need and go litter picking. There are high vis vests, 10 litter picking grabber tools, sets of gloves and black plastic bags. Karen will give you a sign out sheet so you can check out and check back in what you use. Bring your own gloves if you prefer. 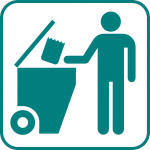 There are no arrangements for Shropshire Council to take away what you collect but if this stays low key with small groups then the suggestion is that you use your own bins/recycle boxes.